Ballymore’s exciting Derby prospect, Margin Trader (pictured), is back at Ellerslie on Saturday when he competes in the Group 2 Avondale Guineas over 2100m – a factor co-trainer Chad Ormsby believes is key to his progress. “He’s back to going right handed which I think he prefers judging by his two career runs going left handed,” Ormsby said. Margin Trader will be lining up in what appears to be the strongest three-year-old race of the season with the likes of Volkstok’n’barrell, Mongolian Khan, McQueen, Rockfast and Sound Proposition. 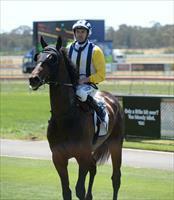 “We are happy with how he has come along since his last start and he’s improved a lot. He’s going to have to be at the top of his game,” Ormsby said. The second runner for the New Zealand team will be last season’s Group 2 Wellington Cup winner Graphic who will be contesting the Group 2 Avondale Cup over 2400m. Graphic ran a terrific fourth in the Group 1 Zabeel Classic on Boxing Day, before running second in an open handicap event a fortnight later, but was unable to sustain a strong enough run in his attempt to make it back to back Wellington Cup’s last month. Noel Harris will be riding Margin Trader, while Michael Coleman has been engaged to partner Graphic.